After a marathon game that last almost 6 periods, the Chicago Blackhawks were lucky that they walked away with the game, won by a triple OT goal. The game went into the third overtime lasting four hours and 53 minutes after the first puck had dropped. 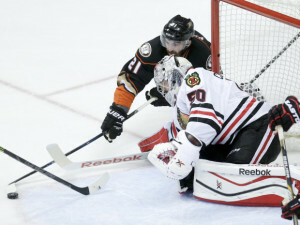 The winning goal, was wristed by defenceman Brent Seabrook in the direction of the Anaheim net but with a little luck hit team mate, centre Marcus Kruger’s stick and dropped into the crease, where he was able shovele it in behind Andersen, to put to rest the longest game in Blackhawks’ 89-year history. Their 3-2 win evened the best-of-seven Western Conference final. Now 38 very tired NHL players boarded their planes for Chicago, where Game 3 will take place Thursday. Game 2 had so many amazing saves, wasted scoring chances, missed nets and hit crossbars that it’s hard to recount them all. The goalies were sensational, Corey Crawford made 60 saves of Anaheim’s 62 shots and Andersen stopped 53 of 56 shots made by the Hawks. In regulation, the Ducks outshot the Blackhawks 17-1 in the final 12:48 of the second, and the relentless pressure finally paid off in a tying goal, after a long shift in the Chicago end, with Perry tipping a knee-high Ryan Getzlaf shot past Crawford at 17:30 of the period. After that, it wasn’t until 11:08 p.m. Eastern time, 2:08 a.m. Pacific, that another goal was scored. The three OT periods played between Perry’s goal and Kruger’s was pure playoff magic, including Andrew Shaw’s now infamous disallowed header. Chicago, who only played four defencemen, played them to the point of exhaustion, including Duncan Keith, who played just a few minutes short of 50. Quenville was able to milk amazing performances out of his team, even if at the end their tongues were hanging out. Can Chicago do it again? Probably not with so much expectation at home, look for the Ducks to get one back from the Hawks.